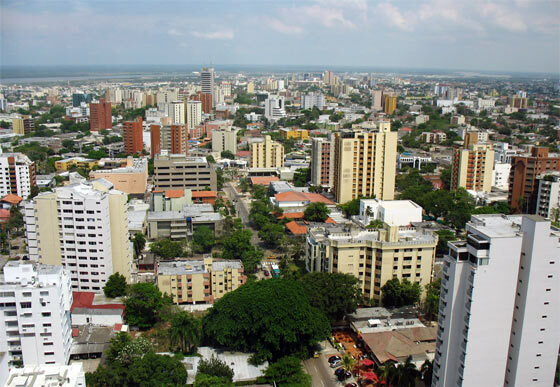 Barranquilla is by far the biggest city on Colombia's Caribbean coast. It is an important port and economic centre, but offers less to the tourist than its glamorous neighbours Cartagena and Santa Marta. The city lies at the mouth of the giant Magdelena River. This used to be the main entry point for goods into the country. It was also the place to which arrived thousands of immigrants, particularly from the Middle East and Europe. This influence can still be felt in the city today, especially in terms of food, music and dance. Indeed, one of the city's most famous exports, Shakira, has Lebanese heritage. The city lies equidistant between Cartagena and Santa Marta and as such many travellers get no more than a fleeting glimse of the city out of their bus window as they skim round the outskitrs travelling between the two tourist hot spots. Unless you have a specific reason to visit the city (the famous Carnival held here is certainly one of them!) then it's probably best to give it a miss if you have limited time to spend in Colombia. However, should you find yourself here with a day or two to kill, there are definitely some places of interest dotted throughout the city. 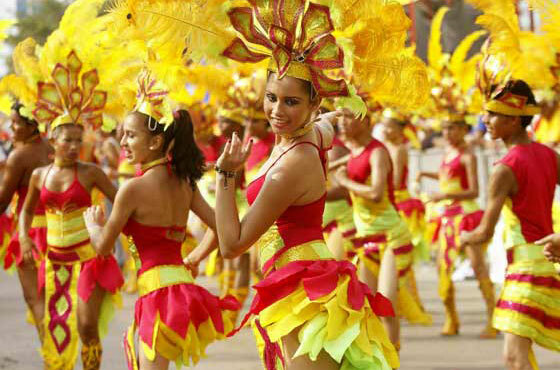 Every year in late February/early March the city becomes awash with colour, music and dance in the form of the Carnaval de Barranquilla - Colombia's biggest carnival. For the four days over which the carnival is held you can enjoy colourful parades, watch concerts and cultural performances, and generally drink and be merry with the rest of the Barranquilleros in part mode. In fact, so impressive and important is the carnival, that in 2003 UNESCO declared it a 'Masterpiece of the oral and intangible heritage of humanity'. The 'Museo del Caribe' (Caribbean Museum) is a great place to learn about the fascinating history and culture of the Caribbean coast of Colombia. There is also a special room dedicated to Colombia's most celebrated writer; Gabriel Garcia Marquez. The museum is currently Spanish language only, so try to find someone who can help you with translations if your own Spanish is very limited. Also worth a visit is the 'Antiguo Edificio de la Aduana' (the old Customs Building). This building is of great importance historically to the city and contains some interesting exhibits. The colonial building itself is interesting and provides good views out to the Caribbean Sea. The best hotel in the city is Estelar Alto Prado. This terrific hotel, located in the north of the city, inlcudes an outdoor swimming pool, gym and restaurant. For a slightly cheaper option try the quality Hotel American Golf. The hotel has spacious rooms and a good restaurant and gym.